Forecast over hierarchies of products and customers. Top down or bottom up (or middle and both ways!) Drill down or up with a simple double-click. Multiple users access the same, shared database concurrently with instant, real-time consolidation. A full product / customer / measure security model. Using the open source R Statistics and Data Science framework, Prophecy provides world-class forecasting algorithms in full ‘Automatic’ mode (no statistical or R knowledge needed) or with ‘to-the-metal’ access to all of R.
Provide a single, integrated view of forecasted Volume, Sales Revenue and Margin, presented over the every permutation of product and customer hierarchy detail. Prophecy™ - forecasting for business! Prophecy™ combines user-friendly demand forecasting, leading-edge statistical forecasting, predictive financials, trade promotions and major customer planning in a single, integrated solution. Streamline your sales forecasting process using battle-proven sales forecasting software. 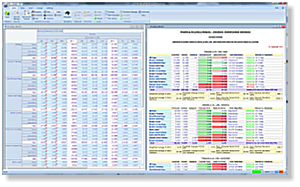 Free your forecasters from cumbersome spreadsheet based solutions for forecasting sales. Implement multi-user software for forecasting sales, faster and at a much lower cost than competitive solutions, typically in less than 10 days *. Frequent and highly variable promotional activity. Active competitors, with equally frequent and variable promotional activity. Promotions which occur at different times each year. Major customers represent a high proportion of total sales. Prophecy™ helps forecasters interpret and understand the factors that statistical algorithms struggle with, by presenting the data in a variety of intuitive, graphical and insightful ways. Prophecy also features an optional Trade Promotion Planning module, which allows itemised promotions to be planned, modelled, approved and evaluated. Prophecy™ is for front-line business sales forecasters. It helps them productively apply their specialised knowledge and judgement to the sales forecasts. All within an easy-to-use, Excel type experience. However, Prophecy™ goes way beyond Excel in its specialist analytic and sales forecasting features. Prophecy™ is a 'live' view of detailed volume forecasts through revenue and profit. It consolidates in real time over multi-level hierarchies of products and customers. The forecasted measures in your Prophecy™ system are completely customisable. Start with volume, extend to revenue and margin, compare with budgets, plans, other versions. Prophecy™ offers you much more than just volume sales forecasting. Standard costs and selling prices are pre-imported into the database (or prices and discounts can be modelled manually). The revenue and profit impact of volume and pricing changes are instantly aggregated in real time over a complete hierarchy of products and customers. Forecasts can be analysed and 'risk-assessed' within Prophecy™ at any hierarchy level for volume, revenue, profit or any other forecasted measure. Prophecy fully supports 'forecast / review / re-forecast / publish' workflow. Prophecy™ elegantly implements control, visibility, tracking and sharing of the sales forecast. Escape the 'many versions of the truth', bloat and data fragmentation issues associated with Excel sales forecasting spreadsheets. Forecast, analyse, compare with budgets, prior years or previous forecasts - for volume, revenue, profit or any other measure. 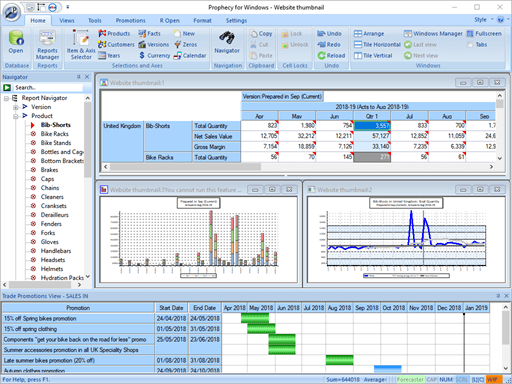 All within Prophecy's easy to use, multi-dimensional views and graphs. Every Prophecy report acts as a forecast data entry screen, supports hierarchical drilldown/up over products or customers, live graphs, back-solving, unlimited undo/redo and many other forecast productivity aids. Capture and audit every forecast change in the Prophecy Tracking database - date, time, who made the change etc..
See all this and more in action via our online demo. Forecasters will learn from forecasting errors and avoid repeating the same mistakes. Management will spot which forecasts need reviewing, earlier. Forecast accuracy stays 'front of mind' for forecasters when it is easily visible to managers. Accuracy analysis is hard to deliver in fixed-view sales forecasting spreadsheets. Prophecy™ gives you accuracy data at any level of hierarchy and over any time horizon, with summary statistics like MAPE, MAD, two types of weighted average and over/under frequency distributions. Prophecy™ quantifies the added value from judgemental forecasting, by comparing the published forecast with the statistical forecast that would have been generated using the available sales history. Click here to see a sample output. Prophecy™ is exceptionally quick and easy to implement. The software runs on Microsoft Windows 7 or newer clients. It hosts its data in a shared MS SQL Server database MS SQL Server database. It supports concurrent, multiple-user, read-write access without 'sub-cubes' or individual spreadsheets and real-time, maintenance-free consolidation. Adding new products, customers and sales history is a breeze. Use the Prophecy Database Manager application's "write once, use many times" automation module to maintain Prophecy. 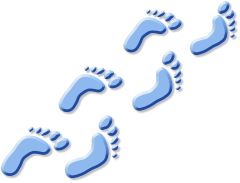 Other systems connect to Prophecy data via SQL or scripted data exports. .
Each user's product, customer and measure-based security is rules-based and requires minimal maintenance after the intial setup. Multi-level sales forecasting over hierarchies of Products and Customers. Use state of the art R statistical forecasting, in 'Automatic' or 'Expert' mode. Forecast, analyse, report and track products, by customer, by measure and time within a single solution. Extend volume forecasts into sales revenue and margin. Boost forecaster productivity. As easy to use as an Excel forecasting spreadsheet, but designed from the ground up for multi-user sales forecasting and demand planning. More than a collection of statistical algorithms! Prophecy™ offers many, carefully thought out forecaster aids, productivity enhancers, views and analysis screens, as well as its statistical forecasting engine. Prophecy saves time, via continuous, multi-user, concurrent sales forecasting, with real-time consolidations, using a single, shared database. Implement faster, at lower cost, (typically in 10 days or less*). Low ongoing maintenance with new products, customers and actuals data loaded automatically using re-usable scripts. A proven solution. Currently used for forecasting beauty, personal care, floorcare, coffee makers, food mixers, pet care, cleaning products, and more. 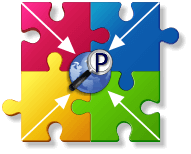 Integrates with SAP, Microsoft Dynamics, Sage, NetSuite etc. through SQL queries or delimited text files and Prophecy Automation. News Read our latest Newsletter online! January 2019 sees the launch of another major release for Prophecy which adds fully automatic (i.e. round-trip forecasting / no R or statistical knowledge needed) and expert mode integration with the Microsoft R Open software environment for statistical computing. 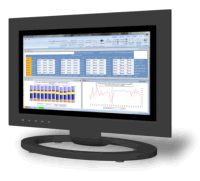 Access world-class time series forecasting models from within Prophecy's safe and user-friendly software environment. Please click here to jump to the Prophecy R statistical forecasting microsite pages. Click here to see a detailed history of the major changes to Prophecy over the last few years. *10 days implementation claim means with 10 or less days implementation support, working remotely with VPN access to your network. Please contact us for more information on how we can work together implement your forecasting solution within 10 days.